Air conditioned return pick up transfer with private car. Indonesian buffet lunch with halal food. Short pants or swimsuit, extra dry cloth, sunscreen, hat, sport shoes or strapped sandal, extra money for drinks, souvenirs and photos. CAN I BRING CAMERA AND VIDEO CAMERA? YES, we is providing you a dry waterproof bag to put your camera and video camera. But it would be safer if you do not bring your camera as we have photographer to take your rafting moments. You can purchase your photo at our photo corner. For video service will require 48 hours prior notice. DO WE GET FOOD DURING THE EXCURSION? The River is safe for children and our entire excursion is suitable for aged 7 years to 65 years. For child under 9 years, they can joining on the rafting with special request. WHAT IS TO SEE DURING THE TRIP? Along the rafting adventure at Ayung River, you’ll see dramatic waterfalls, lush rainforest, verdant rice paddies, high cliffs and breathtaking gorges with wild life like birds and monkeys. 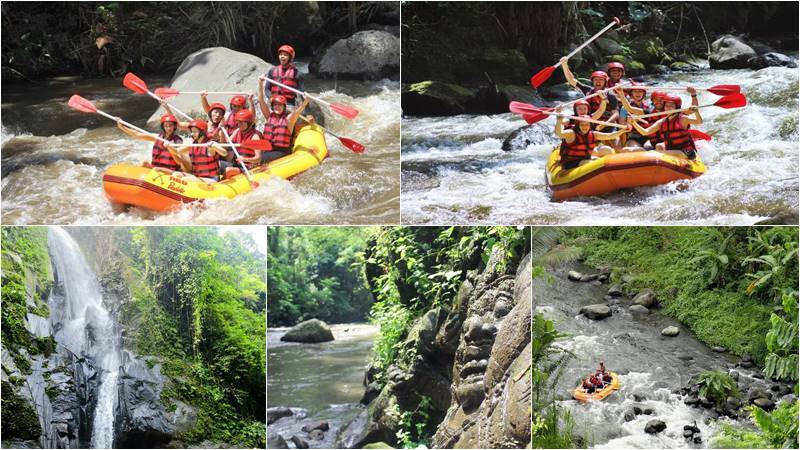 Ayung River rafting trips last approximately 1 ½ to 2 hours, you will get wet and wild and full of fun for sure!